Marigot Bay is the huge anchorage on the French side of the island. To the east lies the town dominated by the fort on the hill which is beautifully lit at night. It is a lovely anchorage with clean water with its only drawback is that it can become quite rolly in northerly swells. A walk up the hill to the fort will reward you with interesting history and fabulous views. The Marigot market is well stocked with a better than average selection of arts, crafts as well as the usual T-shirts. Best days for the fish and vegetable/fruit vendors is Wednesday and Saturday with the latter being the premier market day. The market at Marigot is justly famous. 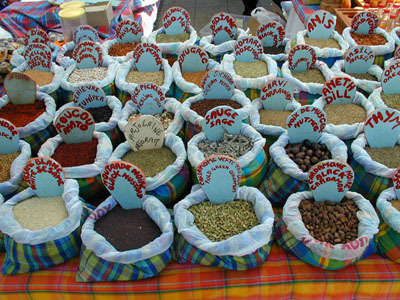 Spices on display. The French bridge is on the spit of land to the south of the anchorage and you can dinghy through this bridge (fuel available in the cut) to the French part of the lagoon. There is a fuel dock in this cut on the starboard side as you enter and a laundry/internet cafe on the port. The USMarket which, despite its name, is a well stocked French market has a dinghy dock just inside the lagoon. Enter through the French Bridge and hook around to port just to the south of the fuel dock at the little marina. Excellent selection of wines, cheezes and fruits and vegetables. is located. The water is cleaner and the restaurants and grocery stores are better on the French side. If conditions permit, the restaurants and snorkeling are good in Grande Case which is also out of the area of the Harbor Master in Marigot. Lovely colored building in Marigot . Simpson bay on the left, Marigot on the right from the fort.